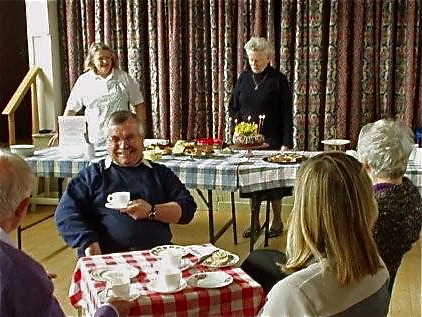 Birthday Surprise at the Coffee Morning! Many thanks to all those who attended the Coffee Morning on 29th March. A good time was had by all, and Margot Levell was totally surprised when we all sang happy birthday to her. She blew out the candles on her chocolate cake made by Sue and everyone had a piece. The baking was up to the usual excellent standard, with the addition of some savoury tarts for those diabetics amongst the community who can’t take too much sugar. Ian Marshall’s daughter-in-law made a really scrummy carrot cake which went down well. The savouries were such a success that they will be included in future coffee mornings – so there will be no excuses not to attend! The next one is on 26th April at 10.30 – put it in the diary now!